Ades leads the BSO in his "Totentanz" featuring mezzo-soprano Christianne Stotkijn and baritone Mark Stone. This fall, on October 28 to be exact, with a vocal/piano recital of Schubert’s haunting “Winterreise” (Winter Journey), the venerable Boston Symphony Orchestra launched its first ever “artistic partnership” with former British wunderkind Thomas Adès. Still British as the concerts demonstrated, at 45 Adès is a fully mature composer, well beyond the wunderkind category. 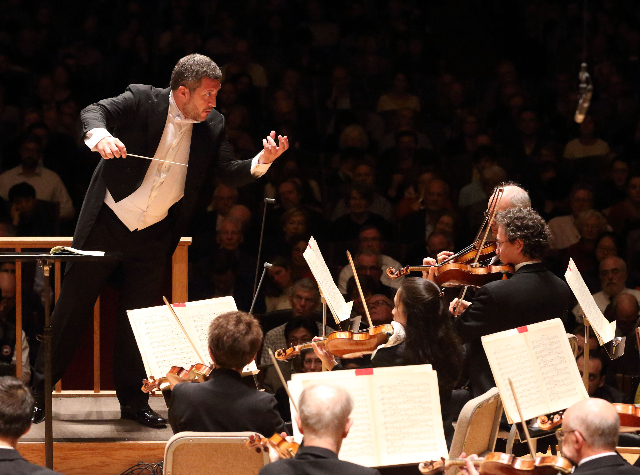 Why the BSO eschewed the designation of “composer-in-residence” for Adès, a position which many American orchestras, if not the BSO, have hosted for decades, is that he is a triple threat – a composer, yes, but also a conductor and a pianist. In the roll-out of what will be a three-year relationship here and at Tanglewood, Adès demonstrated over a crowded week all three of his musical skills, accompanying tenor Ian Bostridge on piano in Schubert’s final song cycle, joining the Boston Symphony Chamber Players, again on piano, in a concert that included one of his own compositions, and finally, and most impressively, conducting a concert with the BSO at Symphony Hall that featured one of his most recent and most powerful works. That all three concerts featured vocal artists gave this opera critic license to cover them. Let the critic report: It was all (mostly) good, although niggling thoughts remain. And that’s what they pay (or not) critics for: to find the imperfections among the perfect. He was fine – perfect - as an accompanist to Bostridge, but he was no more than that: an accompanist. He played with limpid tone, his sound bell-like but muscular and alive to the shifting rhythms and moods of the work. But he knew that the moment Bostridge started singing no one would be paying much attention to him. Which was a little perverse in that this was his first appearance as the BSO’s much-ballyhooed new artistic partner, when ordinarily he would be the very center of attention – pazienza! that would come later in the week. “Winterreise” is a special work in the song literature. A genre that was typically presented in private salons during candle-lit musicales that featured a little of this and a little of that, song cycles tended to be not terribly demanding either vocally or thematically. Love lost was a frequent subject, but the account of a lost love turned to madness that Schubert addressed in Wilhelm Müller’s 24 poems, bringing them to an even higher level of intensity, exploded the genre, turning something inherently minor into something major. Like Beethoven’s Ninth Symphony, “Winterreise” is not a work you want to experience too often lest it become commonplace. If you do hear it, you want the performers to be of the caliber of Bostridge and Adès. For some - I would include myself among them - “Winterreise” is a landmark of western civilization, a masterpiece that seems to exist outside time and place. Schubert himself called the songs “spine-chilling,” but they are more than that. They express a philosophical bleakness that is beyond the contours of the German Romantic world Schubert helped define, seeming to be of the same world as Samuel Beckett. Could his Vladimir and Estragon be trudging through the same desolate landscape that Schubert’s wanderer inhabits? (If so, they at least had each other.) This is “modern” music, and even though subsequent concerts would feature music by Igor Stravinsky, Jean Sibelius, Benjamin Britten and Adès himself, “Winterreise” was the most modern music on the programs. Bostridge is a riveting performer. From the moment he walked on stage ten minutes late, tension rising in the packed auditorium, he projected a neurotic interiority that seemed to shut him off from the outside world and keep the outside world from him. Tall, preternaturally thin, Bostridge, even in his early 50s, seems to be an Anglican choirboy, and he sings like one as well. His high tenor voice can be expressive, dropping into its lower register, and he can rough up his tone a bit when necessary, but it is generally sexless in its “white” perfection. The cycle is usually sung by baritones who have a deeper and earthier range that fits better the emotional tone of the work; when a tenor like Bostridge takes it on, the inviolate purity of the voice seems slightly incongruous, creating unease from the first notes, making the suggestion of madness seem all the more natural. The wanderer in Schubert’s cycle is never light-hearted and gay, but in Bostridge’s interpretation he is beyond the emotional brink from the very first notes. There is no gentle entry here – Bostridge plunges you immediately into this existentialist Hell. As the song cycle continues – it lasts about an hour and a quarter – I began to think that in Bostridge’s interpretation, the wanderer is not just a normal man – granted, a young man highly susceptible to romantic notions - who falls into madness (or maybe quasi-madness) by a love gone wrong, but a man who was mad to begin with. And if he is a man who is crazy from the start, how are we to accept his narrative of his journey as any more than a delusion? The evidence of the poems suggest that the wanderer does in fact inhabit the real world – the final, emotionally devastating poem in which he encounters a shoeless hurdy-gurdy man churning out his songs on the frozen landscape seems real. If it is all just the imaginings of a madman, locked in a room in a madhouse, then it loses much of its affective power. Not that Bostridge’s interpretation is not worthy of consideration. It is highly provocative, which is one reason it has proved so popular in the world’s concert halls. It’s an interpretation none of its listeners will soon forget, it’s just that it’s wrong-headed. In his second appearance as the BSO’s artistic partner two days later also in Jordan Hall, Adès was again not the center of attention. (Pazienza!!!) As the pianist with the BSO’s chamber players, Adès showed himself as he had with Bostridge to be a good colleague. He did choose the program, heavily weighted to British composers, and he programmed one of his own works. Maybe it’s just as good that the concert was poorly attended. It was the least satisfying of the three, and it revealed a nationalistic side of his artistic personality that is not particularly attractive. 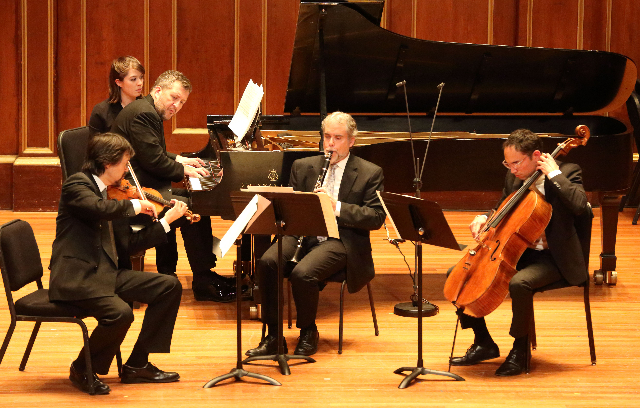 It opened with Benjamin Britten’s “Sinfonietta, Opus I,” Britten’s very first published work. For a composition by a 19-year-old student, it is remarkably durable and mature. It is lyrical in a mild modernist manner, showing knowledge of both Arnold Schoenberg and Ralph Vaughn-Williams. Adès conducted the 10-member BSO chamber players, but he was unnecessary: These expert players could have played by themselves. The next piece was Adès’s own “Court Studies from the Tempest,” our first exposure to his own music. Drawn from his 2004 opera “The Tempest,” from which he conducted a selection with the BSO five years ago, it was not done well here, even with Adès on the piano. The piece features jagged rhythms and rich textures in which fragments of melody come in and out of focus. It is a work of sharp contrasts between loud and soft, lyrical and aggressive, the private and public, but those contrasts, so essential to the work’s success, were dulled in the BSO players’ performance, which sounded under-rehearsed. On Youtube I found a video made by students – students! – at Yale that left them in the dust. Anyway, the first half of the concert came to an inglorious thud with the two songs by Purcell/Weldon with Adès on piano and O’Connor doing the vocals. Why Adès wasted his time adapting these two works is beyond me. (Long attributed to Purcell, they’re actually most likely by the forgotten John Weldon.) He certainly didn’t make a case for them here. At their conclusion, I had the uncomfortable feeling that I’d just spent the afternoon in the parish hall of St. Aidan’s in Kent listening to two local amateurs doing their best to keep the British tradition alive. And I ended up fearing that the BSO had engaged as its first artistic partner the composer from Downton Abbey to assuage the never-dying Anglo-philia of a certain strain of the Boston audience. BLAH! What a relief it came in the concert’s second half when the players, with Adès on piano, turned again to abstract music – Schubert’s joyful “Trout” quintet. The five players showed knowledge – and love – of the infectious work, and shared their feelings with the audience. Adès redeemed himself a few days later as conductor and composer with the full BSO at Symphony Hall. Adès has shown that he likes to build thematic programs. In 2001, when he led a performance of an excerpt from his opera “The Tempest,” he also programmed tempest-themed tone poems by Tchaikovsky and Sibelius, and as I reported in his recent program with the BSO chamber players he chose a number of works based on Shakespeare texts. Neither of the earlier concerts here were entirely successful – the Tchaikovsky and Sibelius tone poems were, as I remember, not outstanding among their works. 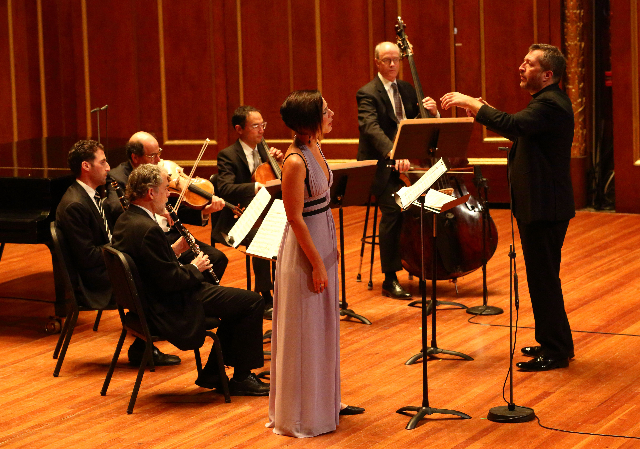 With his first outing as artistic partner, Adès chose better. On the theme of death or last things – maybe he had advance word about the recent election – he programmed just three works, Britten’s “Sinfonia da Requiem,” Sibelius’s tone poem “Tapiola” and his own “Totentanz” (Dance of Death), his most recent major work. The short work (20 minutes) opens with a blast from the drums, which is followed by a dirge-like motif that appears first in the lower strings and is then followed by the woodwinds and finally the violins, each group of instruments maintaining their spatial integrity. Adès paid especial attention to keeping the voices separate, and when they all come together, they retained their crisp and clean sound. The music builds in volume and intensity, and the movement ends with the drums again. The second movement, a Dies irae, possesses a galloping rhythm and exhibits greater orchestral color: a saxophone enters the mix to great effect. There are hints of Latin dance rhythms and the militaristic tone of the work is reminiscent of Prokofiev. The key to why Adès chose this work to open the concert, other than the fact that Britten is his touchstone, is that Britten wrote that the movement is a “Dance of Death,” which is the subject of Adès own contribution to the program. The work closes with a slow Requiem aeternam marked by a lyricism that contrasts with the previous movement. Its essentially banal melody builds to a Technicolor finish, film music being a hard influence for composers to escape at mid-century. Sibelius’s “Tapiola” has no direct relationship to death: it is based on the Kalevala, the Finnish national epic, on which he drew on for earlier works. Specifically, it refers to the fierce god-spirit of the forest, Tapio. What might have brought Adès to program it with works dealing in last things is that it is the final work Sibelius composed before he entered into his long (30 year) silence as a composer. In any case, Adès has an affinity for Sibelius, the great exemplar of Northern Soul in orchestral music, and he brought great feeling to the work. The short work (20 minutes) is marked by lush string scoring that suggests without describing the murmurings of the dense northern forest. 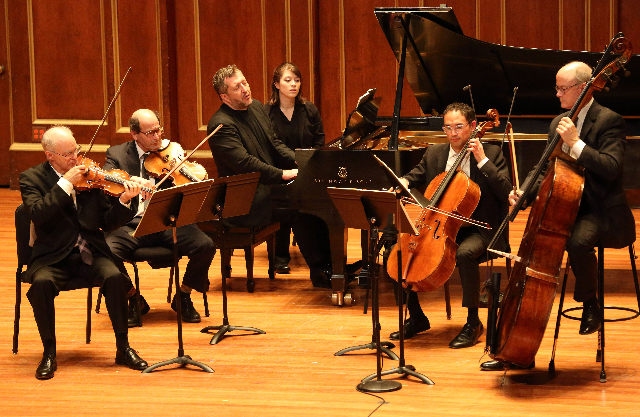 It is a tight knit composition, but Adès found no problem negotiating a path through its thickets. It is verbose, and it meanders getting to its point, but what a glorious sound along the way. This is catnip for the BSO’s strings, and they purred under Adès’s baton. OK, finally the moment we’ve been waiting for, the last work programmed in a week dense with other composer’s music, Adès’s “Totentanz.” And the wait was worth it: “Totentanz” is a dynamic orchestral/vocal composition that erased any lingering doubts I might have had about Adès’s English parochialism. This is music that speaks to our time (it was composed in 2013) in a musical language that transcends Britten and Purcell and the English tradition without repudiating it. Among other declarations of independence Adès might be making from the polite English tradition is his use of orchestral color and sound. The wide range of instruments, some traditional, many not, has been widely noted. Adès’s orchestration calls for glockenspiel, vibraphone, xylophone, marimba, crotales, tubular bells, gongs, anvils, a great variety of drums, slide whistle, whips, clappers, maracas, gourds, tambourine, bamboo tubes, and a set of bones alongside the usual strings, winds and brasses augmented by piano and celesta. What would Benjamin Britten have thought? And he’s not afraid to use the exotic instruments. The work opens brilliantly with a blast from of horns and a vigorous battery of the strings making the noise of their lives. Death is in the room. And he will not be denied. The preacher who opens the work reminds the listeners: “No one can live forever.” And from there it goes. Adès based his totentanz or danse macabre on a 15th century frieze, destroyed during World War II bombings, in the medieval Marienkirke in Lübeck, Germany. In the colorful and folkloric work, death, represented traditionally as a skeleton, dances through society harvesting souls when their time has come. He starts at the top – the Pope is the first to go, followed by the Emperor, down through a mere King and Cardinal to a clerk, a worker, a peasant, a maiden and a new born babe, all powerless before his call. The work is structured simply and ingeniously. Death is sung by a baritone who visits each whose time on earth has come to an end one by one. Each of those about to meet their maker is sung by a mezzo-soprano, so the work moves from one low lying voice to another of different gender. The music of the vast orchestra varies from one victim to another, but not by much – death doesn’t do differentiation, that comes later at the pearly gates, he just harvests souls. The medieval text, which Adès adapted himself, stresses the nature of Death being a great leveler. Yes, there is a hierarchy in that he starts with the Pope and works his way down, but he doesn’t really show much regard for station or wealth. He doesn’t have much time for anyone – there are so many souls waiting for his visit. No reasoning or pleading will dissuade him from completing his task, “When I come, great and small, no grieving helps you,” he sings. The Cardinal’s lament that what his “clothes of Burgundy” will do him no good now, that he will be “worth less than a filthy stinking dog” does not sway death from his mission. There are suggestions of value judgments about how a life was lived. The proto-capitalists of this society are given even less time and no comfort – the mayor, the doctor, the usurer, the merchant are quickly dispatched. After this final burgher is plucked out of his daily life, there is a pause, and the orchestra makes a great noise, a holy racket as it were, that is one of the most thrilling moments in the work. All those exotic instruments listed above play cacophonously, at apparent cross purposes, but with the end result of suggesting the chaos of the world beyond mere appearances. When the reaper continues into the lower ranks of society, he grows more tender in his address, and the music itself, after its great outburst, grows more gentle as well. The peasant, whose life is so relentlessly hard, even embraces the opportunity to escape. Death concludes his excursion through the ranks of society with the babe in his crib, who plaintively asks, “I cannot walk, yet I must dance,” to music of great tenderness that looks to Mahler’s great “Kindertodenlieder” (Songs on the death of children), for a precedent. The work ends with bassoons and drums, Death intoning the word, “Totentanz, totentanz” into the silence. Baritone Mark Stone gave a great performance as Death, suave, ingratiating even, but firm. His voice was steady and focused with a pleasant timbre if not outright beauty of tone, and he enunciated his texts with great clarity. Christianne Stotijn, who sang in the London premiere three years ago, was good, her high notes clear and light and strong, but her low notes tended to get lost in the dense orchestral texture of the piece. 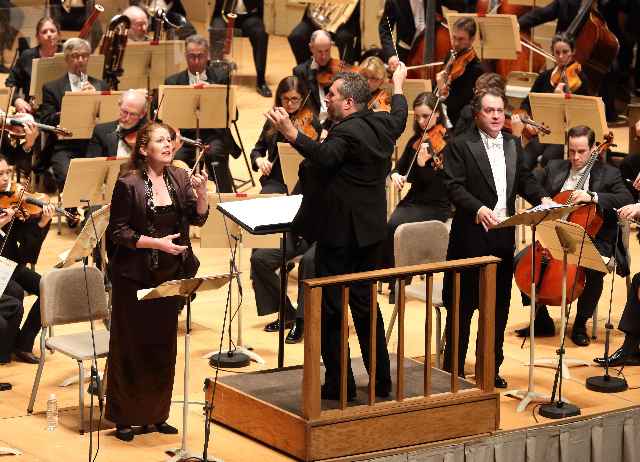 Adès led a brilliant performance – no one knows a work better than its composer – and the BSO responded to him in a way that presages a great relationship.